The Pom Pom is a great little tickler. It is very discreet, and comes in a very cute box, which can be used as a gift box. Add a blindfold in the mix and just have a great time. Very discreet, cute packaging, great for teasing. Size may be different than the site says. 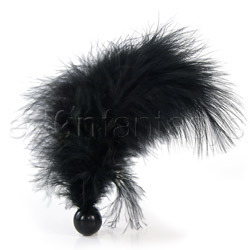 The Pom Pom is a great feather tickler to caress your partner's body or yous. You will get a little bit of a tickle, but not enough to "ruin the mood". This toy is great for couples, who want to find each other's sensitive areas without really touching. This tickler is great for beginners and advanced users, because there is no wrong way to use this at all. Add a blindfold and drive your partner crazy with pleasure. The design is very cute and clean, and the shape is great. Now, the length is a little weird; the site says is it is 7 1/2 inches in length, but when I measured it myself, I measured 5 1/2 in from tip of the longest feather to the bottom of the ball. So, I don't really know what that is all about. This toy is very well made; the ball is made of plastic and the feathers are marabou feathers. This tickler work just as I thought it would. There really isn't anything to it for use. The feel of the feathers on my skin felt very weird at first, because this is my first tickler. After the first shock, they felt great, and my partner loved rubbing it all over my body. With this toy, you really don't have to worry about cleaning it. You shouldn't use any liquids or oils on this product, because they will ruin the feathers. For storage, I keep it in the box in which it came in, which is very cute and discreet. This tickler comes in its own box, which looks almost like a gift bag. The box itself is all black with black decals. On the right side there is a red sticker, which wraps all the way to the back about half way. This sticker has the name of the produce and a little picture of the produce itself on the front. On the back, it tells you what is in the box, in three different languages. If you removed the sticker, you can have the box sitting out and no one may look twice. I really don't have to worry about someone finding it in my house; I just left the sticker on. If you buy this as a gift, you can just slap on a bow and you are good. Sadly, I had to throw this tickler away. My dad's cat thoght it was his toy and decided to eat the feathers off. It was kind of funny to see him cough out feathers, though. I'm not too upset, because I have the Coffret Bliss Bliss kit, which came with one. From now on I have to remeber to keep anything with feather away from the cat. Ha! Cats do love feathers!! Thanks for the review!! Thank you for viewing Pom pom – tickler review page!